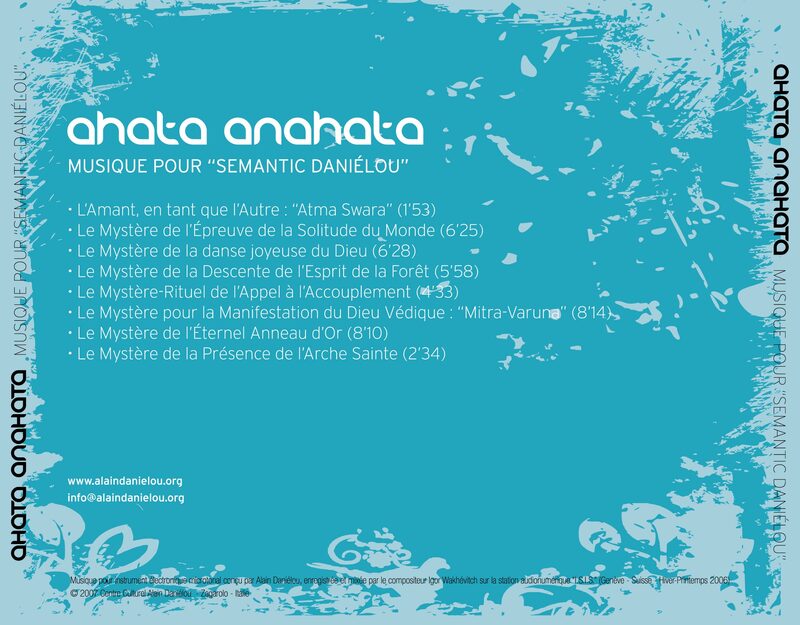 As a young pupil of the great composer Olivier Messian at the Conservatoire de Paris, when we studied Hindu rhythmic structures, Alain Daniélou was considered as one of the rare references in the field, at least at that time. It was the first time I had heard about Hundu rhythms and modes, and their universal nature, since they often appear, hidden, without the listener necessarily being aware of them, sometimes even unnown to the composers themselves, in a large number of classic pieces in western music. A “tala”, generally translated as a “rhythm”, is in fact much more than a simple rhythm. Each rhythmic structure, which itself forms a cycle of its own, has its own particular name; a symbolic name which indicates its esoteric nature. There are thousands of them, as described by Sarngadeva in the 13th century in his considerable work, the « Sangita Ratnakara », meaning “Music of the Ocean” The very origin of sound is considered divine or sacred. Hence one note, « swara », is much more than a note produced mechanically, in a purely physical manner. It is the statement, the signature of the spiritual soul playing it. In India, music is an art which is “revealed”, because Sound IS God: « Nada Brahma ». Sound is Creator, and out of the transmission of the original Sound – whose pronunciation is the Offrand of Sacrifice, in its inseparable form of “Agni”, the Creative Fire – comes worlds, language, movement, just like the variants of the Holy Spirit and the Divine Soul. A symphony of sounds and colours playing in God’s presence, intoxicated by his own Play, his Divine Lila, in ecstasy before his own Self-Manifestation, in – and by – the Power of Manifestation, He radiates his Strength, his Almighty Power, his Consort: the Divine “Shakti”, the “Mother of Worlds”, the Universal Virgin, the Primordial Ocean, of which She is the Entity. The Entity of Relativity, and He, The Supreme Principal. Lovingly entwined, indissociable, Two in One, They Form the Fundamental Unity on which All Rests. One Supramental Trance, at the Summit of Creation. Thus, Unrevealed, Silence, Inaudible, the original Sound Reveals itself, Manifests itself as an audible sound: “Ahata”. This approach is far from what western music has become over the centuries, having slowly disconnected from the fundamental basis from which successively emergenced musical notes, one after the other, forming between them intervals based on whole numbers. Factors 2, 3 and 5 generate the complete range of sounds the human ear is able to perceive, which can be employed musically by means of musical scales or modes elaborated from these sounds, whose pitch and frequency are anything but imprecise. Hence “natural” sounds, and just intonation. These intervals, or proportions, based on whole numbers – which we can constantly observe all throughout Nature and which play an important role in our mental perception-communication system – are deeply enbedded in the farthest layers of the structure of our nervous system and even, in the heart of our brain, constitute the way in which we perceive and interprete sound content. By deciphering the meaning, or signification, in particular that of musical order, based on precise semantic principles, we can establish that, for instance factor 2 forms the interval of an octave, and “opens” the space, determining the spacial framework which will hold the sounds that come and fill it. The registers are fixed, generally from bottom to top, from octave to octave (factor 2), and as such these registers are already “signifiers”; they carry a signification. Thus the three Vedic modes, bestowed by the gods ruling over them, (the three “strides” of the monkey-faced god Hanuman, who “sprang” from India to the island of Ceylan in one giant leap over the sea to rescue Sita from the demon Ravana who was holding her prisoner) can be “heard” in a most powerful magical and operational way, bringing the sound of these three registers to the human ear. Whilst factor 2 always produces a sound with a similar signification – from one octave to another – the role of factor 3, on the on the other hand, octave – allows us to differenciate the expressive nature of sounds. “It is on the basis of this obervation that theories on the scale of sounds were developped in Grece and China – and of course India, with the sound scale theories based on what is named the “cycle of fifths”; useful in tuning an instrument alongside others, but in a rather relative and limited way: it is only true of the first fiths, since we quickly reach the limit beyond which our mind-auditif faculties are no longer able to identify the sounds or give them a precise signification.” (Alain Daniélou, “Sémantique Musicale”, page 45). It must never be forgotten, moreover, that these “significations” are essentially of an esoteric nature; they speak to supraconscious or even subconscious parts of our being; those spaces where, as if engraved in a sort of subtle gelatin – those vibratory “signifiers” are inscribed. The power this implies extends way beyond the psychological realm, holding the ability to provoke extremely powerful, deep reactions in both individual consciousness and collective consciousness, to which these vibratory structures and wave forms communicate, via the vector of our brains… and our ears! In this way, and to remain brief, factor 3 always represents movement, activity. It determines differentiation, cycles, relative time and perception. Perception: an essential word encompassing an entire range, from the most ordinary, basic perceptions to those of an “enightened consciousness”, that of the initiated, the yogi or the warrior, able to spead out their “wings of perception” and reach heightened levels of consciousness, such as the Sufi mystics or the Toltec warriors… or the great musicias of India or Persia, or celestial beings such as Narada the great Rishi, who directly received from the “Trimurti” (the Hindu trinity: Brahma, Vishnou and Shiva) the revelation of art and music, which he passed down to other sages, who in turn passed it on the all of humanity. Such is the importance of this “godsend”: the fundamental importance of considering “ahata”, the “audible sound” – and the music which is its syntax – as essential nourishment for both mind and body. Also, having the ability to differentiate what we listen to, to understand – truly understand – the degree to which that which penetrates our being in the form of sound or music, can have a constructive effect; healing, enlightening, harmonising, a source of strength and vitality, of light and joy and of true knowledge – or conversely, can be destructive, causing all kinds of psychological troubles, addictions, dreadful illnesses, dulling wits and creating deep imbalance within individuals and society, leading to disruption, terrible violence and accidents of all kinds. We devour and consume this “audio” automatically and in response to our most basic, primitive impulses, an audio which is often no longer music but mere rumbling and noise, barbarism, in proof – if it were needed – of humanity’s absolute ignorance and oblivion of the authentic and superior power of sound and notably audio which is, alas, in these dark and perverted times, becoming more and more a poison in both its rhythms and its sound vibrations, which are of the lowest, darkest and crudest nature, spinning man’s vital centres in the opposite direction: such vibrations are deathly torpedos which enter into the very core of the cells, into the structure of the physical body, and diffuse vibrations of death, which many people mistakenly take for the expression of youth and the liberation of an excessive vitality of life. A terribly foolish delusion! Which we will inevitably pay a high price for sooner or later, collectively. And yet we could instead introduce “mantras”: powerful vocal formulas of secret sounds – the Nada Brahma – carriers and of vectors of Immortailty. Having mentioned factors 2 and 3 (producing the octave and the fifth, or its opposite, the fourth), let us now consider what Alain Daniélou said of factor 5 (to the numerator; 5/4 – 5/3 – 45/32 – 15/8 – 10/9, etc. ): ” Emotions and feelings arise with factor 5. All rhythms of a hypnotic kind have a base of 5.” (Sémantique Musicale, page 63). «The existence of three numeric elements (2,3,5) in the practice of all musical systems is easily demonstrated through experience in all music which is not conditioned by instruments with fixed sounds, as long as the measurements are taken on on living music with a semantic and emotional content. What is more, their systematic use gives immediately observable psycho-physiological results. If, however, the music becomes an abstract construction which does not take into account our mental perception-communication system, its direct effect on our vital centres is greatly reduced. It is, evidently, possible to establish divisions on the scale according to other bases than the said “natural” intervals, however the intervals obtained will be transposed in our perception, which assimilates them as neighbouring intervals of the system 2-3-5. The significant reduction in the psycho-physiological effect of music is due to the fact that our mental energy is engaged in providing feedback in order to interpret the sounds. Western music is based on an artificial sound system which implies a constant mental adjustment by feedback mechanism. Furthermore, musical theory and notation in western society does not take into account the physical and physiological realities based on controlled phenomena within audition which have nothing to do with the theories of harmony and acoustic treaties which are largely based on approximative observations made on inexact musical instruments. These observations have rarely been verified since the time of Pythagorus and the systematisations of his Greek, Arabian or European successors. 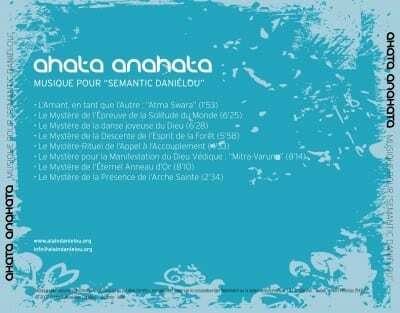 Such is precisely the case for the electronic instrument invented by the regretted Alain Daniélou, the “Semantic”; a prototype developed by IT and acoustic engineers who worked directly under the leadership of the eminent philosopher and ethnomusicologist. Never yet having been used by a composer, this instrument offers the distinctive feature of being tuned in an extremely precise manner, according to the scale of intervals put developed and brought to the light of day by Alain Daniélou in certain of his works on comparative musicology and on musical semantics. Nevertheless, the instrument in its present state has a number of weak points: a series of strong tones which are very limited and not ideal for the musicality it offers, a lack of expressivity in the keypad, the horizontal keyboard with accordion buttons which does not enable any real virtuosity of touch (except, perhaps, for an experienced accordionist!) and the impossibility of creating vibrato, glissando, or pitchbend – yet sliding notes, or “meend” in Indian music, are an essential part of musical expression, not only for distinguishing the colour of each individual artist but also as a means of allowing a musician, in an instant of brilliant inspiration to reach an incredible, unexpected note at a precise moment during a raga, or as part of its development. The creation of a first work for the Semantic (to be played on the instrument) was however an important goal in order to explore its use in a contemporary work inspired by the Esoteric Philosophy of Sound mentioned briefly at the beginning of this text, so that it may progressively become – with the necessary perseverance – the base of a new musical language for western composers, opening for them new windows and new doors towards the promise of musical landscapes of immense richness and beauty, of a renewed notion of music built on foundations which foster a connection with the sacred and the divine. The gift of a new era in humanity, in the art of sound, in which, as in all else, one cannot exist without the other. My approach is without doubt clumsy, impefect and full of inaccuracies, but hopefully it has perhaps the value of being leading edge work, which has I dare say has been always been my nature; walking on unbeated tracks, where both music and human existence in general are concerned. 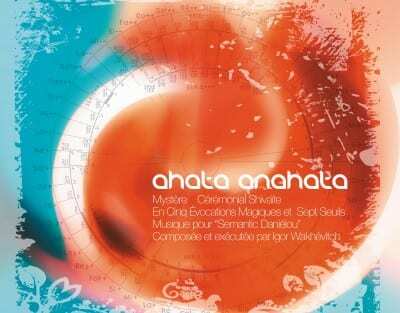 « Ahata-Anahata » (literally, the Audible and the Inaudible) was composed on the Semantic, making the most of its most interesting particularity; the possibility of using an entire scale of intervals which cannot be produced on a system using the westered equal tempered range (by which the octave is divided into 12 intervals in theory equal and identical, from one octave to the next, but of which some are not natural intervals). The Semantic, on the other hand, offers the musician a sale of 36 notes or micro-intervals per octave, among the 52 which make up the Daniélou scale. Given that this work is relatively short for music based on a modal (instead of tonal) system, the “time factor” is fundamental in creating the whole atmosphere of the interpreted piece, in particular with the use of a “drone” (i.e. the tonic note of the mode held continually throughout the entire length of the given mode, which evolves during the raga played by the musician, singer or instrumentalist). I have essentially only worked with two modes, whose tonics are successively Eb (which represents the interval of the weak minor third, when C is the tonic: Eb corresponds with the fraction 75/64, whose emotional character is sadness and hopelessness), and F natural (4/3) whose charcter as interval compared to the C tonic, is calmness, tranqillity and passivity; the latter, as is well known, always containg in reality tremendous strength. Great strength and power can thus be built out of this calm and tranquillity. Thus I was able to use it in order to express, at the appropriate moment, this power, strenth and intensity,which is never that of violence, as for example in rock music. The listener can feel it for him or herself, better than words and explanations can portray. The F is an extremely important note in traditional Hindu music, if we consider it forming the interval of a fourth, when the tonic is C (shadja) in a scale of seven notes or swaras that Indian, Hindustani or Carnatic music scales contain. As for the “shrutis”, or micro-intervals between the swaras, there are said to be twenty-two of them, yet in reality there are many more than this, held more or less secret. Without going into details which would take us too far, the scale based on the note F – Madhyama grâma – the “middle scale” is the one which is conducive to meditation and useful for character building. This F as tonic can be heard all throughout the central and final part of “Ahata-Anahata”, but the subtle key which appears as if to introduce the resolution-conclusion of a Vedic ritual, is the second degree, “rishaba”; the note of the Sacred Bull (rikhab), associated with the moon and with “soma” – the gods’ drink of immortality which created a state of estatic trance and which here is in reality expressed by the true fifth (3/2) of C, the lower fourth of F.
“Ahata-Anahata” (the Audible and the Inaudible): the heart of this work is the “Semantic”, however the score was conceived in the form of a Vedic Ritual transposed into highly meaningful music, or musical drama, in which the Inaudible provokes the Audible, and the Audible attracts the Inaudible, like the Eagle swooping on the Lamb (symbol of the soul). The secret power of “Anahata” (the Inaudible) is incorporated within “Ahata” (the Audible), and this is one of the reasons that the “Audible” carries within it the power to reveal the “Inaudible”. The complexity, yet extreme simplicity, and above all the absolute unity of the two aspects of “nada” (1) (the Primordial Sound, beyond the Audible and the Inaudible), the complete interpretation of the Inaudible within the Audible and of the Audible within the Inaudible – Two in One -, brings not only great power but also an inner ecstasy which could be compared with the spiritual intoxication – including the physical body – of the Soul’s ecstatic Love for its Divin Lover. Such Power of Sound, or “Sounds of Power” is the essence of the language of the Gods, the secret signature of the Principles by which They manifest worlds; tey are the cosmic energies that Nada Brahma Creates from its divine power of self-manifestation. …the Power of Manifestation of the Primordial Sound (Creative Power, which in Itself is a power of Alignment and of Assembling of filaments or cosmic cords, likened to the Hair of the Supreme Saviour, the Wind-Hair of Shiva) … sets alight the supramental powers of God; the principles of creation which, within the Supreme Divinity, are its own organs, worlds, inner divinities, plexuses or chakras, dwellings, pillars, Holy Arches of Will-Power. Inconceivable dimensions. Inner Proportions, Inherent to the Manifested Trinity of God. Chakras: “Merukhand”, Spine, symbolised by the sacred mountain, Mont Méru, upon whose summit lies the dwelling of the gods, the Axis of the World, that of all worlds and all creatures; the Radius of Creation, the Cosmic Scale. The Scale of the World, along which souls rise and descend, Notes (swaras) evolve, inspired by the gods. These “notes” are beings. Ragas, invisible entities, divine beings. Silent Sounds, messengers of the music of the spheres, which we must learn to capture, to hear deeply within ourselves, in the profound silence of the mind. “Nada Brahma”.